You’ve seen the news. You’ve almost certainly even seen the return, and unless you’re a devoted follower of the Dodgers’ farm system, you may not have recognized any of the names. Brendon Davis and A.J. Alexy were low-level guys who weren’t on many radars, and even the known guy in the deal was a back-end Top 100 prospect, an unorthodox-shaped hitter without a position who has never been talked up as any kind of future star. So it’s easy to look at this deal and call it a big win for the Dodgers. They just added one of the best pitchers in baseball to an already-dominant pitching staff. Breaking the all-time record for wins in a season now isn’t that far-fetched. They are going to enter the postseason as the clear team to beat, and all it cost them was a guy who didn’t really fit on their roster in an obvious way and two lottery tickets in A-ball. None of that is wrong. The Dodgers did well here, picking up a difference maker without surrendering any of the guys they see as potential core pieces for them down the road. But baseball trades aren’t always zero-sum affairs, and just because this was a nice move for LA doesn’t mean the Rangers got taken advantage of here. For starters, we have to remember to adjust the expectation of a realistic return onto the market in which the transaction happened. Last winter, the market for bat-first sluggers cratered, so everyone who signed a first baseman or a corner outfielder with questionable defense got a cut-rate deal compared to what similar players had gone for in prior years. The same was true of rental players this year; the returns for pending free agents was just significantly less than we’ve come to expect. J.D. Martinez got traded for a couple of low-end prospects and a throw-in. Solid role players like Lucas Duda, Addison Reed, Pat Neshek, Eduardo Nunez, Jaime Garcia (the first time, at least), Melky Cabrera, and Joe Smith were traded for prospects you’ll probably never hear of again. And, of course, Darvish was traded for a back-end Top 100 guy and some filler, bringing back what looks like less than we’ve seen rent-an-aces return in other years. But this wasn’t other years. This year, the best teams all had huge division leads, lessening the incentive to make a big midseason acquisition, since all they would really be acquiring is a better roster in October, when randomness often reigns supreme. The teams in actual playoff races are mostly looking at a Wild Card play-in game, and giving up a high price to land a guy who may or may not be available to pitch in a winner-take-all contest isn’t something most teams are interested in. When it came down to it, the only teams all that interested in paying a real cost in prospects to upgrade their rotation were the Yankees and Dodgers, with Darvish and Sonny Gray representing enough supply to meet that demand. Despite the Rangers’ best efforts to drum up interest — I was told that they were calling teams who hadn’t expressed any interest in Darvish up to a half hour before the deadline to see if they wanted to make a late bid — they just found themselves in a disadvantageous position; there just weren’t enough suitors to really start a big bidding war. And while that seems crazy, since Darvish would make every team in baseball better, his recent performances did indeed seem to cloud his market. As I wrote in that piece last week, there were legitimate reasons to be concerned. In July, batters are hitting .288/.331/.540 against him. The .363 wOBA he’s allowed is his second-highest monthly total in his career, behind only July of 2014 (.379 wOBA allowed), which preceded him being shut down for the rest of that season, and then he was diagnosed with a torn UCL before the 2015 season began. It’s fair to say that a healthy Darvish has never had as bad a month as he’s having right now, at least from a results perspective. So Darvish’s stock has to be down at least a little bit. We’ve already seen prices for rentals down significantly this year, and the Rangers were already unlikely to land a monster return due to Darvish’s impending free agency. While Darvish is a very good pitcher, he’s also running the lowest strikeout rate and highest home-run rate of his career, and his in-season trends aren’t that encouraging. If a team was already a bit queasy about paying a premium for a rental, Darvish’s recent performances didn’t do anything to help convince anyone to overpay. So the Rangers were selling a struggling pitcher in a buyer’s market. It just isn’t realistic to think they were going to get what David Price brought Detroit in 2015. But even with those limitations, it’s not like the Rangers settled for nothing here. This isn’t the J.D. Martinez trade. Willie Calhoun, in particular, could be an underrated pickup for Texas. Yes, he’s short, he’s stocky, and no one really wants to stick him at second base in the big leagues. His defensive limitations are why he’s consistently ranked in the 75-100 range on prospect lists, despite an offensive profile that portends potential excellence. But it’s also not entirely certain that those rankings are correctly penalizing him for his defensive limitations, especially when you consider how other bat-only prospects have been treated. For instance, let’s take Josh Bell. This is what Eric Longenhagen wrote about him when he ranked him as the 50th-best prospect in baseball. Bell’s well-rounded combination of on-base ability, bat-to-ball skills and in-game power is strong enough to profile at any position, including first base. He’s a bad defender and hasn’t made the strides many hoped he would during the year and a half he’s taken reps there. Purely on offensive value, he projects as an above-average regular. If he ever becomes a competent defender at first or somehow moves back to the outfield, he’ll be more than that. I’m not sure either of those is going to happen. That’s a pretty similar profile to Calhoun, except Bell’s defense was being derided at the lowest spot on the fielding spectrum; there wasn’t much hope he could move anywhere else. And he ranked 50th on our list before the year began, despite offensive performances in the minors that were inferior to what Calhoun has put up. And Eric was actually the low man on Bell, rankings wise. Baseball America ranked him 35th before the season. MLB.com ranked him 20th. BP ranked him 25th. While there’s obvious physical projection differences with Bell, who is at least four inches taller than Calhoun, Calhoun already is showing the power that Bell’s height allowed projection for, and his contact skills appear even better. And neither one of them were getting any credit for providing value in the field. But Calhoun consistently ranks 50-60 spots lower, likely due to the fact that there just aren’t that many short power hitters out there. 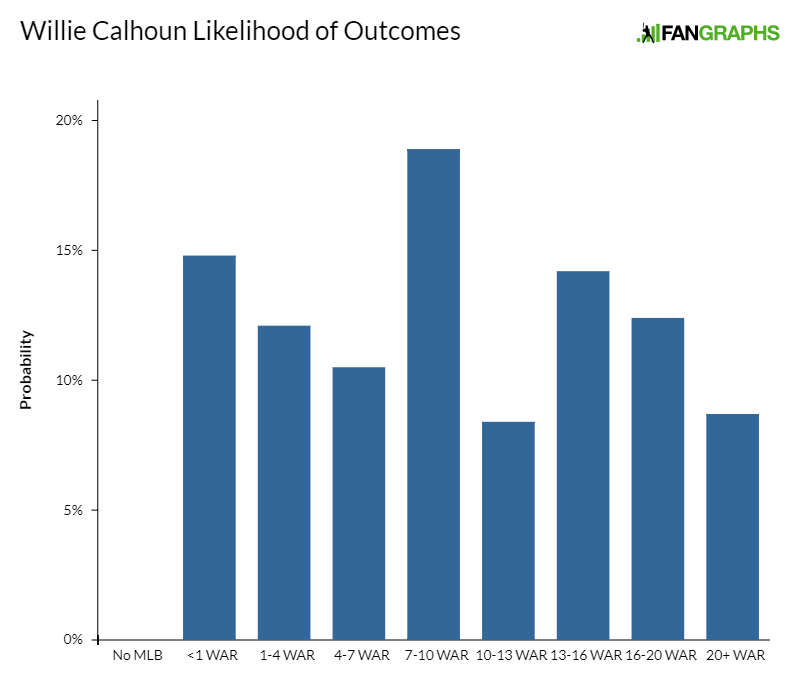 Calhoun is an anomaly, and it’s not easy to look at him and imagine exactly what kind of big leaguer he’ll turn into, since not many big leaguers look like Willie Calhoun. But if he was a few inches taller, he’d probably be eliciting some Daniel Murphy comparisons. The skillsets are pretty similar, even if Calhoun’s a bit more extreme version of the “oh God you’re playing him at second base?” aspect of things. But Murphy’s turned himself into one of the best players in baseball despite being a defensive liability at second base, because his contact-and-power offensive game allows you to overlook some groundballs rolling into the outfield. We probably won’t see Calhoun at second base in Texas, given that they have Rougned Odor, and Jon Daniels suggested they’d develop him as an outfielder. Again, there’s not much confidence in the game that he’ll be very good out there, but then again, there wasn’t much confidence that Kyle Schwarber would be able to handle left field when he was getting ranked as an untouchable elite prospect either. For taller hitters with more of a pedigree, the lack of defensive value doesn’t seem to translate into the same kind of rankings it has produced for Calhoun. And Calhoun’s offensive performances suggest that he might have that kind of elite offensive value. He ranked 15th on the stats-only version of KATOH’s mid-season Top 100, and even when accounting for the public rankings, he was 24th on KATOH+. Even with a significant penalty for his defensive flaws, KATOH is kind of in love with Calhoun. Here’s the probability distribution chart that Chris will show you in his forthcoming projection piece on the Rangers’ return for Darvish. Based on his minor league performances, KATOH thinks there’s legitimate star potential here. This isn’t just a guy with an okay bat; guys who hit for this combination of contact and power, at these ages and levels, become impact big leaguers on a pretty regular basis. The fact that he’s a bit of a unique player matters, as there’s more uncertainty with guys like this then with guys who fit a more traditional profile. And it’s folly to conclude that every short guy has the same upside as taller hitters just because Jose Altuve has turned into a monster. Altuve is amazing because we’ve never really seen anything like him, and not every short slugger is now Altuve 2.0. But we all whiffed on Altuve in part because too much was made of his height, and not enough of his ability to just barrel the baseball. The industry mostly missed on Daniel Murphy even after he broke out against big league pitching, because he doesn’t really look like a second baseman either. The reality is that if Calhoun hits like his numbers suggest he might hit, he’s probably going to be a lot more valuable than a bunch of other guys who were regularly ranked higher than he was. So if Calhoun is really more like the 50th best prospect in baseball, instead of the 90th best prospect in baseball, then this return isn’t all that different from deals for rental aces we’ve seen before. The Rangers weren’t in a great spot to turn Darvish into a huge haul, but there’s a pretty good case to be made that they didn’t really sell Darvish light here, even in a buyer’s market. Calhoun is a pretty nice return for any rental, even a pitcher as good as Yu Darvish. We hoped you liked reading The Dodgers Did Not Steal Yu Darvish by Dave Cameron! It’s certainly a better scenario than holding onto Darvish, which pretty much everyone thought happened at 4 EST yesterday. So I don’t think Rangers fans should be too upset.